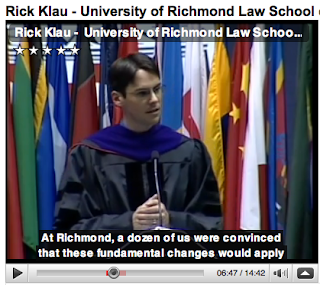 tins ::: Rick Klau's weblog: YouTube Captions: This is Big. I announced it on Buzz, and almost immediately one of our users (someone I've corresponded with on several occasions about Blogger) complained. I was expecting complaints - people aren't thrilled that we've made this decision - but not Rob's. "arrrgh no captions on that video? *sigh"
But wait! YouTube announced today that they can now do auto-captioning for all English language videos (with other languages to come). I turned it on for the screencast, and given the technical nature of the words, it wasn't perfect. YouTube lets me download the captions file, however, so all I had to do was open that up in a text editor, and 30 minutes later I had an error-free transcript of the talk (with the timestamps embedded to ensure everything synched up). Uploaded that into YouTube - and bingo: perfect captions, completely synched to my speaking. It gets better. 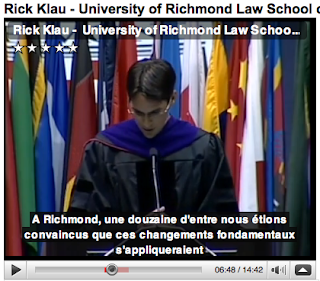 I noticed that the Captions interface included the ability to upload a transcript, which made me think about the commencement address I gave last year. Unlike other speeches I've given, I wrote this one out in its entirety - and posted it to my blog. I took the text from that blog post, uploaded it, and after just a couple minutes, YouTube converted the transcript into closed captions for the video. Other than a hiccup with the first few minutes (my transcript begins with my remarks, but the video starts with Rob's introduction of me), the text matches my delivery perfectly. Just like with the screencast's captions, the words can now be translated into any of the dozens of languages YouTube supports. This is big. For Blogger, it means that help videos - previously all but impossible to use scalably (we offer Blogger in 42 languages) - can now be more tightly integrated into how we communicate new features. For users, content across languages becomes more accessible. There's no doubt bound to be tremendous search implications (we are Google, after all). And to all the Robs of the world, for whom YouTube was a silent, ever-growing archive of video, I imagine this is indeed huge news. Glad to see it, considering the deaf ratio (at least in the UK) is 1 in 7 people, a huge chunk of people. OK. Time to re-think the video angle. Good thing I'm pretty. I found YouTube's auto-timing from a transcript worked for a bit then totally lost the plot, never to get it back.